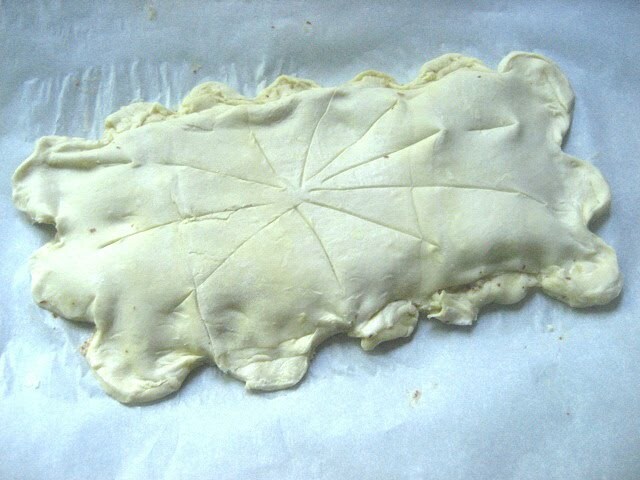 Not exactly the right month to be making a Galette des Rois! 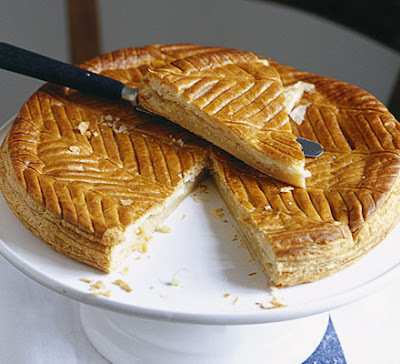 A Galette des Rois also known as a "Kings Cake" is traditionally eaten in France on January 6, Epiphany Day. Many countries celebrate this tradition and bake a little dried bean or ceramic baby inside the cake and whoever bites into it gets to be "King or Queen for the day" (and maybe a trip to the dentist!). I know New Orleans also has a similar cake for Mardi Gras. I take requests, and this cake was requested by my friend who had a birthday last week. She is Parisian and has not had this cake since she was a child living in France. Could I PLEASE bake this for her? It was her all time favorite. I read somewhere that if you make this any other month than January, then just call it a Pithivier, which is basically a puff pastry pie filled w/ frangipane! I guess you could go all out and make your own puff pastry, but only one request per person. 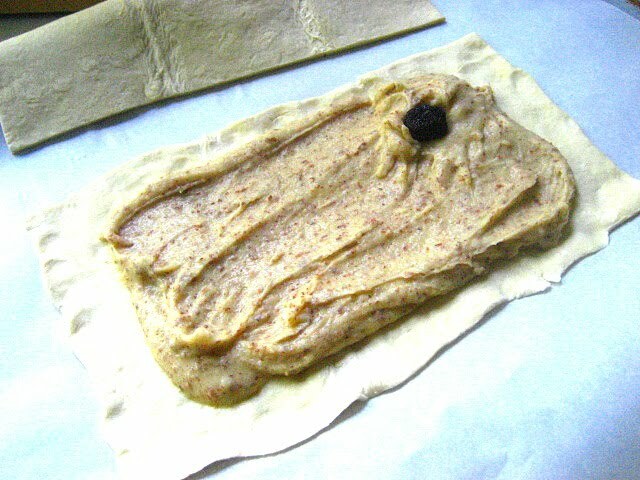 Spread one sheet of puff pastry out on a parchment lined baking sheet. Spread your filling in the center leaving 2" around the edges. Put the dried bean or dried cherry somewhere on the almond filling (frangipane). Now lay the other sheet of pastry on top, pinching the sides together to seal the sheets together. Decoratively scallop the edges with a paring knife, discarding the scraps. Brush w/ an egg wash.
Bake on the parchment paper at 425 for about 20 minutes. If your pastry is starting to brown too soon, then turn the heat down. Please do not request a beef stew in August, because I am not that nice. Stacey, can I please request a red velvet cake for my birthday? The date is Sept.29. Thank you! 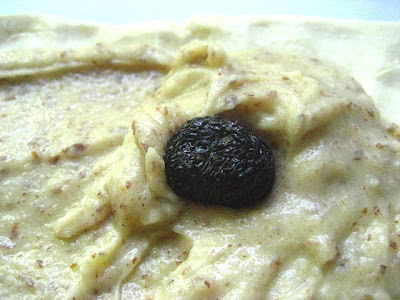 Almond flavouring remains a favorite. While trudging over the dunes at LBI this summer, I told my 3 sons about my introduction to the taste sensation, as a child, at LBI, in the form of a Good Humor toasted almond ice cream bar. You know how the ice cream truck man rides up each street and jingles his bells? I didn't even like ice cream, still don't, but something about that almond taste, mysterious, and to my childish palate, sophisticated. Love anything almond. Did you make that beautiful cake in the first photo? So professional. Growing up in France this cake was a holiday favorite, and we always bought ours from a bakery that put a ceramic baby inside! This sounds delightful. I will have to give it a try. I took a class on how to make your own puff pastry and I wondered throughout - why would you do this? There is perfectly good puff pastry out there for purchase. Anyway, gorgeous. I'll think about my birthday request for next year. Something chocolate. I will make a simple request - I'll send you a Fed Ex box and you can send me the cake. I'll pay for overnight shipping! You have a very lucky friend! That first photo is a stunner. Seriously beautiful. What a great friend you are! Stacey, you are a fine friend. Gorgeous cake or pithivier. This looks nothing like the (excuse me but they are gaudy) King cakes you see in Louisiana around Marti Gras time. Very classy. Dried cherry good idea, who needs a law suit? I bet it tasted awesome. You are VERY nice.